Oregon's beloved Trail Band brings cheery warmth with your favorite holiday songs - and some original holiday tunes! - arranged in their trademark energetic style. Songs include Joy To The World, The First Noel and more in a holiday concert reminiscent of the parlour orchestras and townsquare brass bands of the last century. 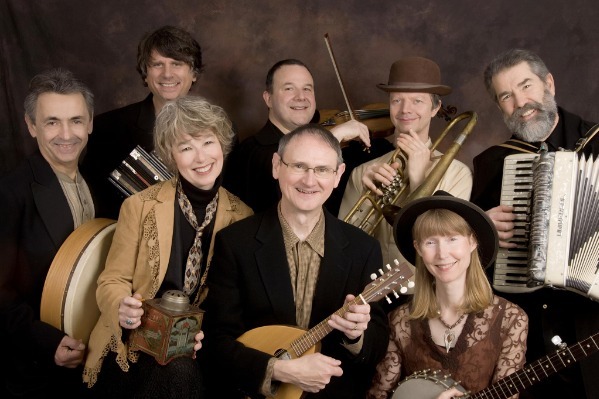 Cornet, tenor horn, tuba, fiddles, hammer dulcimer, guitars, penny whistle, mandolin, piano, saxophone, spoons, bones, drums, bass, and recorders combine with the Trail Band's rich vocal harmonies to create a warm, beautiful tapestry of sound. Originally produced as a television special for Oregon Public Broadcasting, this concert has become an annual tradition for thousands of concert-goers in the Northwest. The Trail Band, formed by Marv Ross in 1991 at the request of the Oregon Trail Council to commemorate the 150th anniversary of the trail, is an 8-piece ensemble that creates an energetic blend of brass and string arrangements of traditional and original music, featuring five great vocalists including Quarterflash's Rindy Ross. Tickets are $25-$40 and available online (with a small processing fee), or in person at Grass Roots Books and Music or Corvallis Brewing Supply.